A Short article looking at the likely chances of Le Pen winning the next French Elections in April 2017. We now know the outcome of the first round of voting in the French Elections on the 23rd April 2017. As thought in my previous article, the two contenders are Emmanuel Macron and Marine Le Pen. Macron polled slightly ahead of Le Pen and is the current favourite to win the Presidential Prize. Is it a foregone conclusion? Using the opening of Polls chart for the 7th May 2017 at 08.00CST, we can see which of the two candidates is likely to gain the crown. Naturally we still need to keep in mind the charts in the foregoing article published on my website in February 2017. If we take this as a straightforward contest chart, we give the sign on the Ascendant to the favourite and the opposite sign on the 7th to the challenger. The Prize is the planet ruling the MC and/or 10th sign. Macron is the current favourite so he gets the youthful sign of Gemini, ruled by Mercury as his significator. Le Pen gets Jupiter as the ruler of the 7th sign, Sagittarius. The prize is indicated by either Saturn as ruler of the MC, or, Jupiter as ruler of the 10th sign. First, we analyse the condition and aspects of Mercury, noting Mars is located in the first sign, close to the Ascending degree. Mercury is in Aries, a cardinal sign ruled by Mars. There is mutual reception by sign between Mercury and Mars. Mercury is in the terms of Mars (just). The sign of Aries is the fall of Saturn. Mercury is peregrine, he has nowhere to hang his hat. Both the Rising degree and Mercury have gone past the degree of the MC (15 Aquarius). The Ascendant degree is 17 Gemini and Mercury is at 24 Aries. These are separating aspects. 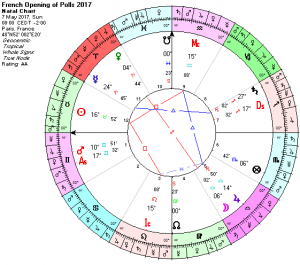 If we take the ruler of the 10th sign, Jupiter (14 Libra) for the prize, Macron’s significators have also passed this degree. There has been contact and good contact, but that is no more. However, if we take the prize as indicated by Saturn, there is a mutually applying application by trine between Mercury and Saturn. Is this testament to the crown coming to Macron? Jupiter is in a cardinal sign, but retrograde. However, Jupiter does have some dignity as he has triplicity rulership and is in his own terms. He and Venus, his dispositor, have some mixed reception as Venus is in his terms and they are in the house of one another’s joy. Libra is also the sign of Saturn’s exaltation. Jupiter and Saturn (the prize) can see one another and have various receptions, even though Jupiter is retreating from the prize. However, the prize does inhabit the house of Jupiter. It is in the hands of the challenger! We cannot ignore the Moon. She first aspects Mars, the dispositor of Mercury, but then immediately carries the light of Mars to Jupiter. It seems the people give their vote to Jupiter. This suggests Le Pen will win the crown! One further point to note: Jupiter is the great Benefic and is within a degree of her Natal Ascendant at 15 Libra. I predict Le Pen will win the crown. I love the way you have interpreted these charts! Will be watching the results with great interest. Now can we have the UK Election please?